Anders Zorn is born in Mora, a town located in the historic province of Dalarna, Sweden. He studies art in the Royal Swedish Academy and begins with the painting of rustic and everyday scenes of his country. In his first works, he uses watercolors; but by 1887, he definitely changes to oil paints. With them, he devotes himself to the painting of portraits, which grant them international recognition; especially in the USA, where bankers and politicians pay great sums to be portrayed. Indeed, during Zorn’s life, he would portrait 3 American presidents. By the ends of 1880 the Swedish begins to work in a genre that would characterize him in the future: the study of outdoor nudes. Yes, outdoors. 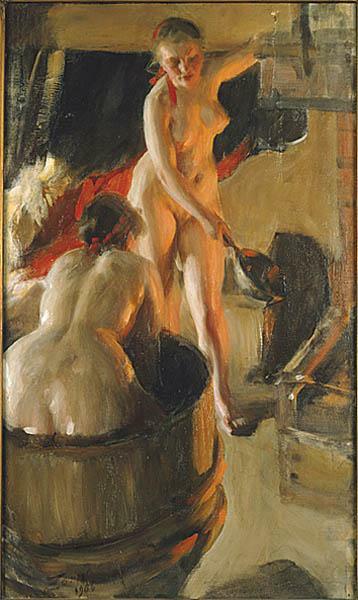 The painting Girls from Dalarna having a bath is an exception in the artist’s work. Beyond this curiosity, today’s painting is interesting for another reason. The story says that, for several works, Zorn uses only 3 colors: yellow ochre, cadmium red medium and ivory black plus white. An extremely restricted palette. However, here we see the infinite possibilities of such limitation. In the scene, we see two women taking a bath inside a room. I think that the canvas doesn’t show the main action, but the moment right afterwards. In my opinion, the woman in front has taken a pot with hot water from the fire to pour it in the tub of the woman with her back to us. But in the painting, what we see, is the woman returning the pot into the fire while, with her expression, asks the woman with her back to us about the temperature of the water. The last one, bends into the tub to touch and stir the water to answer her. Although Zorn’s work isn’t easy to define, I put it under the impressionist and naturalist movements. Impressionist because the quality of the brushstroke although Zorn doesn’t belong to the movement. And naturalist because of the motif of the work: an everyday activity of two working women taking a bath. ~ by Álvaro Mazzino on September 24, 2010. If you missed out on the initial release, fear not: adidas is re-releasing Kanye West‘s YEEZY BOOST 700 “Wave Runner”. According to drop experts Yeezy Mafia, the much-hyped shoe will soon receive a global re-release. This entry was posted on September 24, 2010 at 11:11 and is filed under Impressionism, Naturalism.You can follow any responses to this entry through the RSS 2.0 feed.You can leave a response, or trackback from your own site.